It represents the relationship between heat and temperature. The formula on the left decribes this relationship exactly. The difference between heat and temperature is often misunderstood. If heat is gained, the temperature increases. If heat is lost, the temperature decreases. Heat is a form of energy. Electrical, chemical, kinetic and also other forms of energy can be converted into heat. Temperature is a measure of how hot something is. It is assumed that water solidifies at 0° C and boils at 100° C.
Hence, heat is measured in joules (J), which is the SI unit for energy (in the context of food and diet, the energy unit of choice is calories; 1 calorie = 4.18 J). -If we have 2 cups of coffee, and we add them together, what happens to the temperature and to the energy of the final double cup of coffee? The final temperature will be the same of each separate cup. The energy content of the double coffee, however, will be twice as much as in each separated cup. Heat capacity is given by : c x m (the specific heat times the mass). That means that the higher the mass the higher the heat capacity of a piece of material. 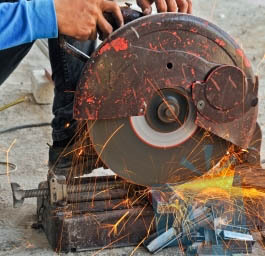 Grinder sparks ( image on the right) don't burn you because their masses are very small and as a result their heat capacities are very low, so that they cannot carry a lot of heat. How much heat is needed to heat 1 liter of water from 0 °C to 100 °C ? or from 10° C to 20 °C? What if I want to raise the temperature of a piece of metal form 0° C to 100 ° C? Is the amount of heat required the same as for the water? The answer is no! Each material has a particular relation between heat and temperature: this is its specific heat (c) . Attention to the units! Sometimes these values are given using calories instead of joules. For instance, if the units cal / g °C are used, cwater = 1 (that is because 1 cal = 4.186 J and we have g instead of kg). In fact, this is the definiton of calorie: the amount of energy needed to raise the temperature of one gram of water by one degree celsius. We prefer to use joules because they are the SI units for energy. 4186 J are required to increase the temperature of 1 kg of water by 1 degree. It is a lot of energy, if compared to the energy required to raise the temperature of metals, as shown on the table. Among metals, aluminum has a high specific heat. That is why it is used in cooling systems like "heat sinks". On top of your computer CPU there is a piece of aluminum to get rid of the heat produced. Also, if you put an ice cube on top of an aluminum block, it will melt faster than if was on top of a similar block made of another common metal. If phase changes occur, a different equation must be used. You probably willl have to use the previous equation also (examples will be given). A phase change means a change in the state of matter (liquid, solid, gas). A phase change implies an input (or output ) of heat. Let's use the example of water, which is a substance that we normally see in 3 different phases. Solid water (ice) melts at 0 oC. If an ice cube is heated, it will begin to melt. The interesting thing is that its temperature is kept constant in this process: it will not rise a tenth of a degree! Even though heat is being supplied! That is because heat energy is being used to overcome the intermolecular forces which keep the water molecules together in a crystal lattice (image on the left). Different materials will take different amounts of energy to melt. This is called the latent heat of fusion. It is the energy required to transform a solid substance (already heated to its melting point) into a liquid. Similarly, when water boils , it does so at a constant temperature. The heat in this case is also used to overcome intermolecular forces that are present (in liquid water they are weaker than in solid water). The energy required to transform a liquid substance (already heated to its boling point) into a gas is called its latent heat of vaporization.